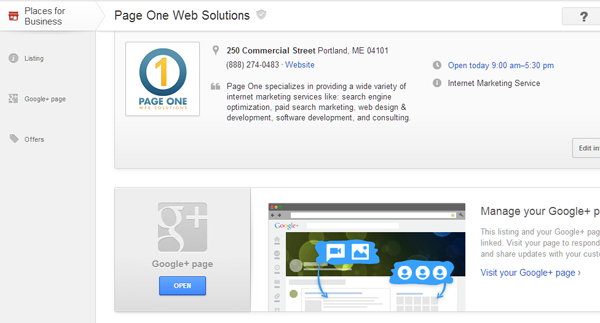 I recently read an article on Moz by David Mihm comparing the business interfaces of Google Plus and Google Places. The fact that we are having this conversation points to the larger problem with Google; there are too many products trying to do the same thing. This issue is complicated by the fact that the documentation is less than stellar. Google Product Forums only get you so far and rather than searching threads you really want something concrete in the official FAQ. Sometimes the issue isn’t with product specific documentation but the lack of info on how two different Google products interact. This is especially true when a new product is replacing an old one but we are in the in between period when they are both live. I suppose this is to be expected when you have a sprawling company like Google; things are bound to become unwieldy. I can’t say that I have a magic solution for them, but I hope they are at least aware of the issue and have someone dedicated to inter-product relations. In the bulk upload interface you don't have any access to Insights, so no impression or action data. Other than getting it verified, there is zero functionality. I reached out to David Mihm (cofounder GetListed.org) who told me that Google is going to roll out advanced functionality for locations added via bulk upload but its a waiting game. I also spoke to Mike Blumenthal (Blumenthals.com) who said that Places for Business is not built with the agency in mind, but for corporations with multiple locations. If I have to sign into a different account for each and every business I manage I can accept that but, at some point in the support process (both email and phone), Google should have told me I was going about this the wrong way. Reviews are tied to the Google Places listing. If you cut ties with a client and delete it from your master account, they can lose their reviews. Google can suspend Places accounts. If they suspend a master account all your clients suffer not just the offending businesses. Google fails to make this information readily accessible and the people they have outsourced support to don't always know what they are talking about. I hope this post can clear up some issues for those transitioning from a focus on the universal algorithm to local search. Please add any similar experiences you may have had or questions in the comments.